Given the recent success of Barri Gotic streets featured in Barcelona Photoblog I resume today this topic with a beautiful alley streaming into the arcades in the square back there. I wandered through the whimsical labyrinth once woven by medieval architects and fascinated as I was I did not take down notes about the place. After some patient analysis on google maps, I jump to the conclusion that this must be Carrer Tres Llits and that that square in the background is Plaça Reial. But then again, I am more interested in the architecture and the view. 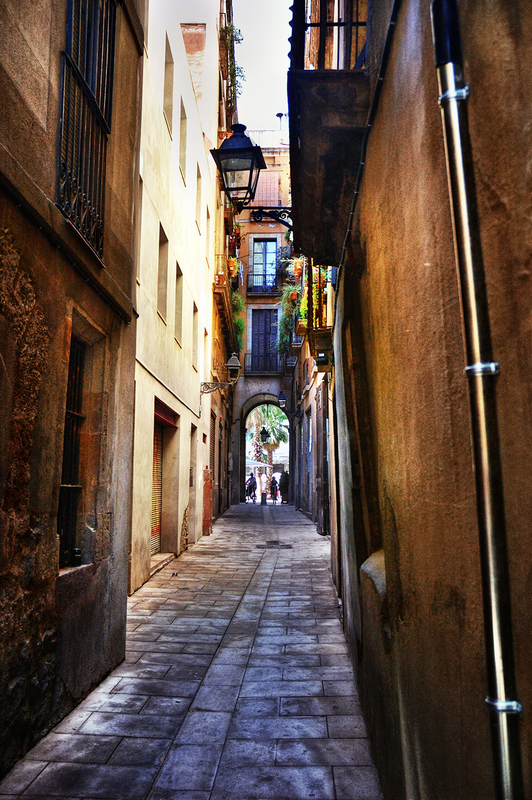 It is always a pleasure to get lost in Barri Gotic during the day. If you are not familiar with the area watch out where you go at night although it is quite safe except for the usual pickpockets. You said yourself, it is a beautiful alley!And a very fine photo. A truly gorgeous photograph...looks almost posterized. I can see what you mean about wandering there at night, tho. I just love this photo! You're absolutely right: it really doesn't matter exactly where it is, because it just takes your breath away this perfect, tourist-free, scene. What a beautiful blog you have, Carlos. You have a great eye - your pictures are a pleasure to look at. I hope you don't mind if I put a link to it from mine. Your photos of this particular area are probably my favorites here at your blog, although it's very difficult to choose. This shot is so evocative, at once mysterious and welcoming, I almost ache to see it in person (but not at night!). this is a beautiful image and glad to see your technique with photomatrix as you have made this a spectacular photo. Your site is great and I enjoy my visits. I have signed up as as follower and will be back more often. This alleyway photo is a blue ribbon award winner! Best in class! Magnifique!